Selecting DBS to install Total Basement Finishing's basement finishing system is a choice of long-lasting beauty and value for your newly finished space. Our goal is to provide and install quality basement finishing materials that have been designed specifically for the basement environment, so they'll last for decades to come. While there are cheaper alternatives to our system on the market, we've developed, researched, and tested a basement finishing system that we believe offers the most valuable return on your home improvement investment. For a free, no-obligation basement remodeling estimate, call or contact us online today! DBS proudly serves Minnesota and Wisconsin, including areas surrounding Minnesota and Wisconsin. Basements are unique spaces that come in a wide variety of shapes and sizes, with support beams, staircases, pipes, furnaces, water heaters, heating ducts, windows, and a variety of other obstacles. 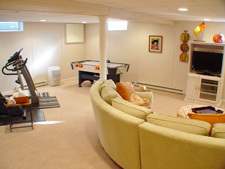 When the basement is finished, it can be done so in an extremely wide variety of ways. Some homeowners opt to finish the entire basement, while others leave a section unfinished to use as storage. And we've installed rooms of all types- from bathrooms and bedrooms to home theaters, personal spas, and basement bars. To put it simply: no two basement finishing jobs are exactly the same. To ask a basement remodeler how much it would cost to finish the basement is like asking a carpenter how much it would cost to build them a house. With unanswered questions like "How large is your basement? ", "How many rooms would you like?" "Will you need egress windows? ", "What kinds of appliances and electrical work will you need?" "Will you be installing our flooring or having a custom carpet installed? ", and countless others, you can probably imagine how difficult it would be to price the remodeling of a basement offhand. DBS would like to offer a free, no-obligation visit from one of our basement finishing specialists, who can visit your home and help you decide on the best basement finishing plan for you. Our specialists are trained and certified at the Total Basement Finishing international headquarters in Seymour, Connecticut to ensure that your service is of the highest professional quality. Your representative will conduct a professional assessment of your basement and make recommendations of effective options for your project. We have a flexible basement finishing system, including a variety of options for your basement flooring, finished walls, drop ceiling, and energy efficient windows. Financing available in Duluth, Superior, Minneapolis, & areas nearby. With DBS' financing (and approved credit) you may take up to 6 months to pay-- interest free! Schedule your project with DBS TBF. A short 10-minute phone call with our financing partner secures payment and gets work started. You make no payments for 6 months from the date of installation. 100% unsecured financing up to $45,000 on approved credit. Add to your home's living space and increase its value now. With DBS' fully transferable warranties, unmatched reputation for quality and customer referrals, you can enjoy the confidence that comes with knowing your investment is being protected by the best in the business... and you can begin enjoying that confidence right away! When you decide to add living space to your home by finishing the basement, our specialists are ready to help. Planning a basement remodeling and working out creative ideas for your basement is fun! A basement is a blank slate that can become almost anything you want, including a personal gym, game room, wine cellar, in-law's suite, extra kitchen, basement library, children's play room, family room, private office, arts and crafts room, personal spa, billiards room, wet bar... the list goes on and on! Total Basement Finishing's products are the perfect way to transform that ugly, damp, cold space into a beautiful, healthy, and warm living space that will become the most popular area in the house. And when you meet with your specialist, ask about how a basement finishing can save you money while significantly increasing the value of your entire home! Once you've created a solid remodeling plan, DBS can draw up a written proposal for you that includes the price of your customized basement remodeling system. They can provide you with a date that the installation will begin, and provide a reliable estimate on how long the job would take to complete, with a basement remodeling being completed in between five and ten days. Whether you decide to go ahead with the estimate or not, the consultation, design quote, and a 90-page basement finishing book are all yours for free- with no obligation. 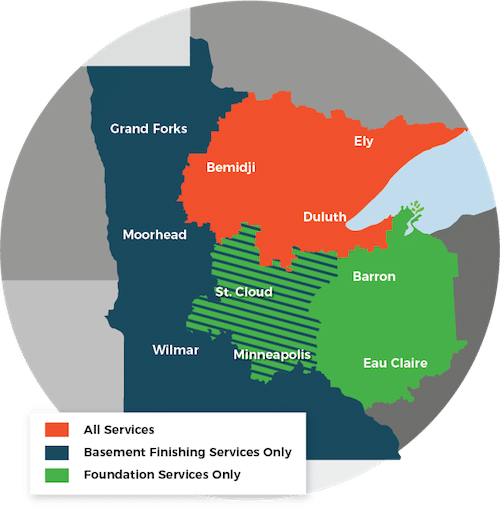 If you live in the Duluth, Superior, Minneapolis, Two Harbors, Cloquet, St. Paul, Hermantown, Virginia, Ashland, Esko area, DBS would like to help you upgrade your basement. 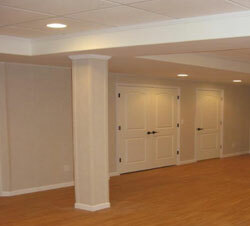 For a free basement finishing estimate, contact us by e-mail or phone today!